If you are like me, just hearing that title probably makes you remember one or more of your parents trying to stuff everything possible into the trunk before your road trips. For me, it was my father who was very picky about how to load a car. He would tell us to put our bags beside the trunk so he could pack them. One summer, I tried to pack them myself but he unpacked them all so he could do it right! Yes, there is a correct way to load a car and my dad wanted to fit as much as possible, have it all stowed safely, and be able to reach what he needed when he needed it. As an adult and a mother of two now myself, I totally understand. After all, if the kids’ backpacks go on the bottom it will throw off the balance and cause problems later when they remember they need their stuffed animals right now. 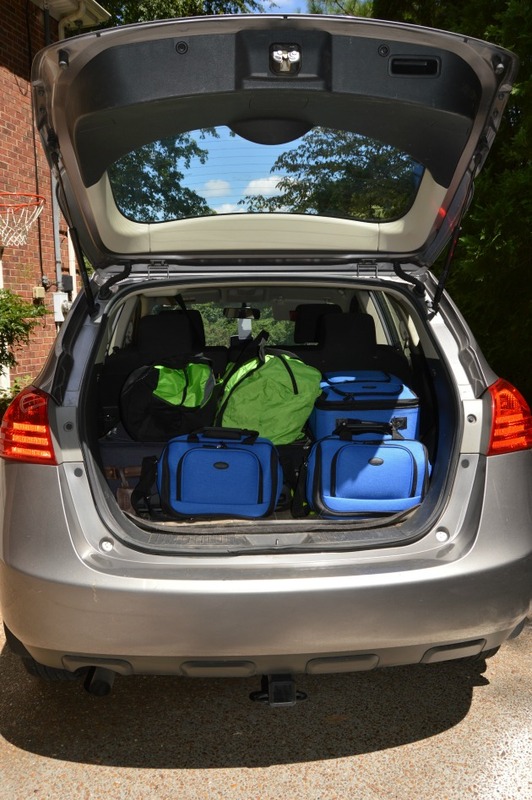 I am excited to work with Kelley Blue Book to bring you these great tips on how to load a car for your family getaway. Kelley Blue Book is sponsoring this post and the giveaway kit but the opinions expressed are my own. As a little fun precursor to my tips on how to load a car for your next family road trip, I decided to challenge my kids to a packing showdown. They went head-to-head on packing up the SUV fastest and most efficiently. I knew they would have fun trying to win for the best packing job and learn a lot about packing as they worked. It was sort of like suitcase Tetris! Now they know the things their father and I go through to pack up the car for summer activities. As I said, there is totally a correct way to load a car most efficiently. Theses tips I will share with you are garnered from watching my father work, packing myself, and some bonus tips from Kelley Blue Book (KBB). As the leading authority in helping consumers choose the best cars for their lifestyle, Kelley Blue book wants to make it easier for families to hit the road. KBB knows the struggle families go through when packing up a car, and actually vets hundreds of vehicles to create its official “Best Family Cars for 2016” list. Their criteria includes everything from testing child safety seats to checking the availability of Apple CarPlay and even conducting a real-world test with real-world families. Do you have one the “best family cars” on Kelley Blue Book list? Don’t worry; these tips will help you learn how to load a car most efficiently for any car. Don’t pack as the bags show up. My dad was very smart to wait to pack until all the bags were ready. If you are stopping for a night along the way, you may not want to bring all your bags into the hotel. Knowing which bags you need for a overnight stop is helpful so they can get packed with easier access. This holds true for a pit stop or if you have packed any food or entertainment you may need. If your road trip includes a side trip that will take you away from the car, remember to pack any valuables within easy reach so that you can keep them safe and take them with you on your detour. Alternately, pack those valuables deep within your stack. Now you have done your leg work and you are ready to start actually packing. You don’t want any big, heavy bags falling out on you or squishing other bags so you will want to pack those on the bottom. Avoid loading SUVs beyond the height of the rear seat backs. Beyond this is unsafe because it blocks the driver’s vision and because if you come to an abrupt stop, the unsecured luggage to hurtle towards the passengers. Nice square suitcases stack well and hold up their shape well so they do well at the bottom of a stack. Backpacks and duffle bags on the other had may get squished and also may cause things stacked on top to shift in travel and fall on you when you open the rear. See if any odd shaped stuff can go in the backseat you like comfy pillows or backpacks with electronics and food. This will make packing easier and allow for easier access to those items. 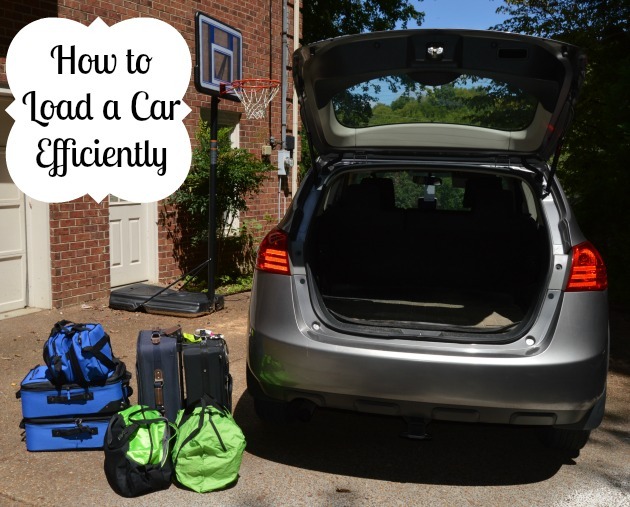 I hope you find these five tips on how to load your car for your next family road trip helpful. 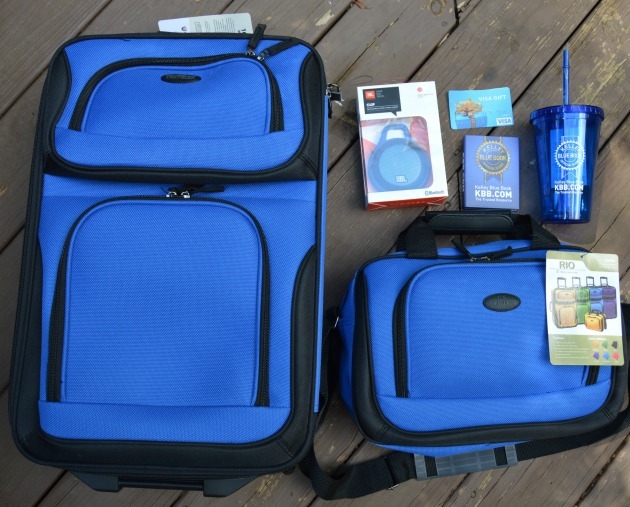 You can also enter to win a Road Trip Kit from Kelley Blue Book to make your journey easier. Enter to win one Road Trip Kit, valued at more than $120, which includes one Carry-On Luggage Set, Kelley Blue Book Swag (sticky note book, tumbler and Bluetooth speaker), and one $25 Visa Gift Card. How to Enter: Enter through Giveaway Tools- just sign into the widget and click the entries you want to complete (comment, follow, or share). Winner announced above in the Giveaway Tools widget on August 23, 2016. Winner will be selected through Giveaway Tools and I will notify by email. Winner must respond within 4 days or the prize will be forfeited and alternate winner will be chosen. Your email will not be shown and will be kept private. What is your favorite family car? What are your favorite tips for how to load a car? My favorite packing tip for a road trip is to have one large suitcase for each person and a carry on bag for the car and the kids take care of it by themselves. I like the 2016 Subaru Outback. 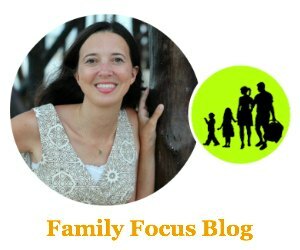 My tip is to monitor what the kids and husband are packing to avoid unnecessary items. My favorite packing tip is to pack items and clothes that you plan on using right away at the top of your luggage. I would recommend the Chevy Tahoe. We have one and love it! My favorite family car is the Toyota Sienna! It’s amazing! One packing tip of mine is to limit each family member to one suitcase. Anything else that needs to come, pack it in garbage bags and label it to keep things organized. We always pack light. make a checklist and follow through it to make sure we do not forget necessities. I really like the 2016 Chevrolet Tahoe. My packing tip is to use ziploc bags for items that can spell or stain, and for small electronics and cords. My tip is to pack suitcases on the bottom and items that you will need easy access to on the top, like the cooler and umbrellas.The Honda HR-V looks great, but I love my Toyota Rav4. don’t take everything, you can pick up items when you arrive! Travel packing tip for our house- to pack swim gear together. I’m able to group goggles, suits and towels. They don’t clutter suitcases and we don’t swim at every stop sometimes. My tip is to make an all-inclusive Excel Worksheet with your packing list. Modify it for each trip. This saves me so must stress of making a list for every trip! Pack light as possible and make a check list. My tip is to pack a road trip snack box for each kid. They can have access to their own snacks without constantly asking. my favorite packing tip is to always pack one outifit for eaach person for each day you will be gone! saves time and hassle and everyone has something to wear each day! My favorite packing tip for a road trip is to have enough snacks for everyone and I like the 201 Chevy Tahoe. Out of that group, my favorite family car is the Chevy Impala. I love bringing extra toys and games for the backseat. Thanks for the share! I like the Kia Sonata. Pack what you think you will need. I like the new Chevy Tahoe. I love my Kia Optima! Always have water in the car. Keep a checklist of what you need to pack. Make sure you have flashlights in the car. Don’t pack too many clothes. You can always wash clothes at the hotel. If you’re going to be doing a variety of activities, try to pack according to your itinerary. For example, put all your beach stuff together while you put your next activity items in a different bag. I like the Honda HR-V. Enough room without being too bulky. 2016 Chevrolet Tahoe would be perfect for trips with my family. My best packing tip is to always make a list and check it off when you pack and then again when you put it in the car. Tahoe is the way to go and my packing tip is to fold clothing and apparel the right way to get the most out of your luggage. It saves space and makes room for more items. Pack the soft items last. I like the Honda HRV. My favorite family car is the Kia Sedona Minivan! I have had mine since 2005 and it has been the best vehicle I have had. It still runs great, and when I am ready to trade it in…I am getting another one! When we go on trips and need more room, I remove 1 seat to give us extra space! I love the Honda CR-V! If I were going to get one, I’d get the Honda CR-V. I definitely agree about it being so much easier to wait until everything is packed. Otherwise you usually end up pulling everything back out and reorganizing it all over again. I would love, love, love to have the 2016 Toyota Highlander. With room for 8 and lots of extra interior space, this would be a great way to travel. My favorite tip is to choose Priority Bags For Easy Access. Snacks and valuables should be within easy reach. My favorite family car is exactly the new car I just got this past year: the Honda CR-V! It’s not enormous, but provides plenty of room for my family of 4…plus the dog, too! My favorite tip is to pack a small bag to keep in the front of the car, almost like a carry on, with items that you may need during the trip. My favorite family car is the 2016 Chevrolet Tahoe! I like the 2016 Honda Civic. My favorite family car is the Toyota Highlander. packing tip – pack several grocery bags to use as trash bags, to keep the car clean – throw out each time you fill up the car. Pack a roll of paper towels to clean up spills or use to clean the side windows and headlights. Put a mini first aid kit, rain poncho, and flashlight in the glove box, and a more detailed first aid kit in the trunk. Always bring along at least one blanket, and several bottles of water in the trunk for emergencies. My favorite packing tip is to coordinate your clothing choices for wearing in different combinations and to pack very lightly. In most cases if you truly need something you didn’t pack, you can buy it at your destination – don’t overpack! My favorite tip is to keep a list with items needed as a master list for all trips. When packing, pull out the list so you never forget anything. I like the 2016 Hyundai Sonata. My favorite is the 2016 Honda Civic! Love the fuel efficient cars! Of the recommended cars, my favorite is the 2016 Honda CR-V. We’ve leased CR-Vs in the past and have really enjoyed them. My favorite family car is the kia optima. The trunk is super roomy and the style of the new ones is pretty on point. My favorite packing tip is to pack a change of clothes (and bathing suit if you are going somewhere hot) in your carryon bag in case the airline looses your bags. For road trips, pack a snack bag and cooler with drinks in case there is nowhere convenient to stop when hunger inevitably strikes. The Kia Sedona looks really nice. I would love to have a new car but don’t see it happening any time soon. lol Thank you! My favorite is the Subaru Outback. My packing tip is to take less than your are tempted to. You can launder clothes along the way. I agree completely with the recommendation of the 2016 Honda Accord. The Accord is my very favorite! I have always like Honda’s,so my favorite is the 2016 Honda Accord. I like the 2016 Nissan Pathfinder. My favorite packing tip is everyone is limited to one piece of luggage. Thanks for the giveaway! I like the Nissan Pathfinder. My favorite would be the Chevy Tahoe. Each time I see one on the road I think that would be the perfect vehicle for us. I like the 2016 Honda Accord! I’m a fan of the Toyota Sienna. My packing tip is to use ziplock bags to keep everything organized within our suitcases. I like the Honda Civic. I would love to own the Honda Pilot. It looks like it would have lots of room in it. I love the Honda CRV for fmaily road trips lots of room to relax while we drive and lots of luggage space. With out 3rd baby girl in April, we needed a van. Our little Kia Forte wasn’t big enough for 3 car seats across the back seat. I’m in love with our Dodge Grand Caravan! It’s roomy and has a lot of room in the back for groceries, or whatever I might be bringing home. The 2016 Kia Sedona looks nice! My favorite packing tip is to start early. A week (or sometimes more!) before we go on a trip I lay out the suitcases in each family member’s room. That way, as they think of things to pack, they can place them directly inside their suitcase. It works especially well for teens! My favorite packing tip is to pack pajamas or other items you need first at the top of your luggage. The chevy malibu is my favorite. I always go with the chevy. My best tip is to keep water, snacks and a blanket in the car in case you are stranded somewhere. Better to be prepared! We coordinate everything when packing so that all the items are rolled into one. This includes tops, bottoms, underwear and socks so that there is no scrounging around to find the other items that you might need. Just grab a roll and go. My favorite packing tip is to have a smaller bag of overnight stuff so you don’t have to dig through the big suitcases before you arrive at the final destination. That way, we only have to open the little bag for pajamas, toothbrushes, etc. I love the 2016 Honda Civic, very fuel efficient car ! My favorite family vehicle is the 2016 Toyota Highlander. I love my Chevy Suburban for family trips because it is big and roomy! I like the tip to put the clothes you need first on top. If there are not many people going, I suggest a Ford Focus. Small but awesome on gas. And my tip is to have your organizing-crazy teen daughter pack for you! My daughter is amazing when it comes to being prepared. my tip is I use Ziploc bags to put things in that will spill on my clothes. I just like the very tidy looks and packaging of the Mazda CX-5. In fact, I find many of the compact cross-over SUV’s to be very appealing. My packing tip is don’t overpack.